So how do you use your Xyonix built models? We strive to be flexible, which is why we offer a number of options including our quick start approach where we get you off the ground using a Xyonix managed service API during the prototype phase, but you eventually take over your project code and address performance, scaling, etc. A slight variant of the quick start option is where we deliver you a fully ready to operationalize docker container containing all dependencies. Another option we offer is our easy to start integration option. 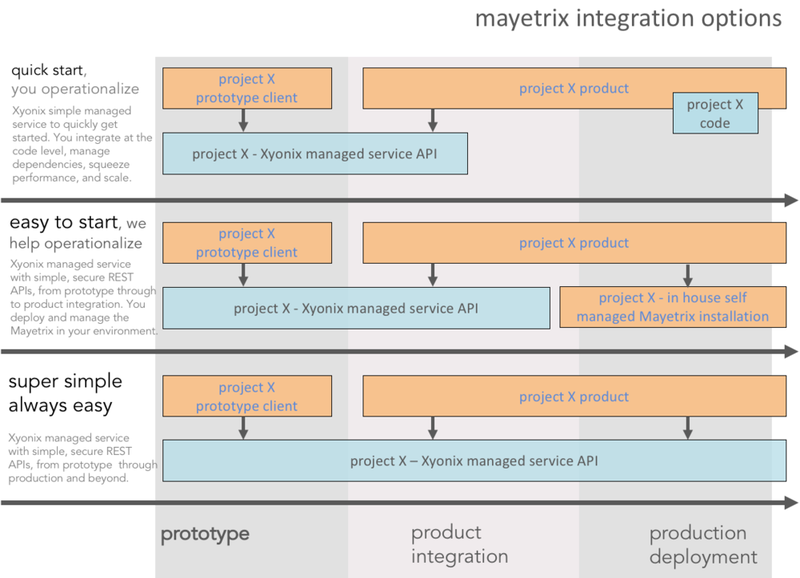 With this option, we get you off the ground using a Xyonix managed service API, but you eventually take ownership over running The Mayetrix and your solution in your environment. A slight option on the easy to start is where we hand over the keys to you for your own AWS environment running all Mayetrix componentry. Finally, we offer the super simple always easy option where we take care of all the operations and scaling headaches, and you just worry about using your secure REST API in your applications.